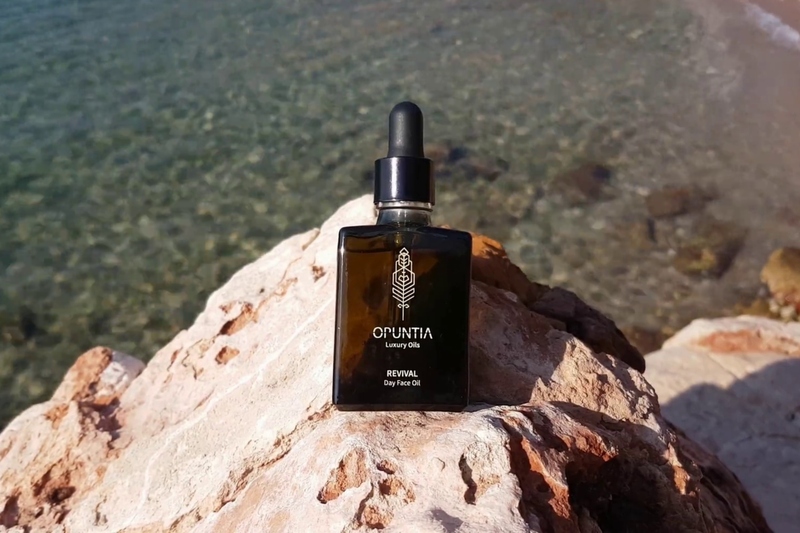 Opuntia Luxury Oils is an organic, Greek unisex skincare line offering botanical oil-based products which cater to savvy, international wellness and eco-conscious consumers. Thoughtfully produced in Athens, Greece, the line has a strong eye toward cultural and environmental sustainability. The high-design glass packaging not only stands out for its simple elegant design, its reusable and recyclable; no plastic or single-use packaging to dispose. With each product sold, a tree is planted through a partnership with the NGO One Tree Planted, giving back to the environment. OPUNTIA (Ficus Indica) means Prickly Pear cactus in Latin. The name is also Ancient Greek, derived from the region Opuntia Locris in Greece. The Prickly Pear (Opuntia) seed oil, the star ingredient in the products, is known for improving skin elasticity and helping retain moisture. The oil has a satiny texture and is easily absorbed, penetrating the skin quickly without leaving a greasy residue. It is rich in linoleic acid, phytosterols, and polyphenols making it extremely skin nourishing. Each seed contains merely 5% of oil, making it one of the most precious beauty oils in the world. Achilles and Kassandra, a husband and wife team, are founders of Opuntia Luxury Oils that conceived of the product line on a secluded beach while vacationing in Mykonos. The products were first created in the couple’s studio apartment under the gaze of the Acropolis in Athens. 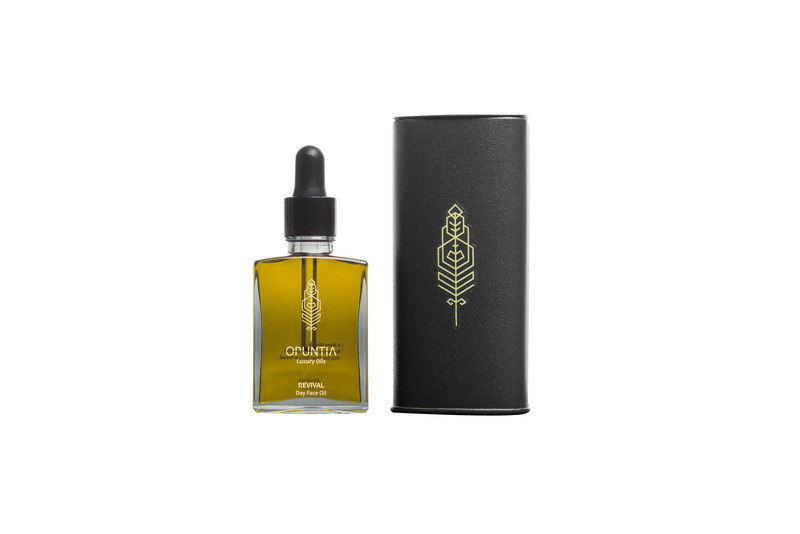 Today, Opuntia offers two Revival Face Oils, one for Day and one for Night, sold separately, in addition to the Revival Set including both products. All products are available through their website and a few select retail outlets in Greece and Lebanon. Their formulations are infused and inspired by their love of the Greek and Mediterranean lifestyle as they continue to develop new products. Kassandra grew up in the US but spent almost every summer in Greece, working with her family’s luxury yacht charter business. She also traveled extensively, setting roots down in many countries, inspired by diverse cultures and how it related to the luxury market. Achilles grew up in Greece, and after finishing up his studies at Oxford and London, returned to his homeland where he keeps a rigorous high profile day job. He finds the time to dedicate to a budding singing career and developing the Opuntia Luxury Oils brand with his wife. REVIVAL Day Face Oil 30ml – This multitasking product is rich, smooth and light textured perfect for day. The exotic all natural blend dynamically hydrates, acts as a powerful antioxidant and carries natural SPF. It promotes a toned complexion, reducing redness and pigmentation while aiding cell turnover, circulation and collagen production. Awaken to a perfectly balanced infusion of mood-improving, uplifting aromas and achieve a more radiant countenance, every day. REVIVAL Night Face Oil 30ml - This reparative all natural blend heals the skin overnight with a medley of fruits, vegetables, roots and herbs, fighting microbes, inflammation and free radicals, the main cause of skin aging. The oil is easily absorbed by the skin for improved elasticity and suppleness. The herbal aromatic infusion relieves mental and emotional fatigue, opening the gateway for restorative sleep. E-shop price: 125 USD Ingredients: Prickly Pear seed oil*, Red Raspberry seed oil*, Rice Bran , Avocado*, Carrot , Sunflower*, Spanish Sage *, Lavender Spike *, Angelica Root *, Wild Carrot *.